Stressed about money? You’re not alone. A recent survey from Varo Money found that a whopping 85% of people said they sometimes feel anxious when it comes to their financial situation, while a full 30% say they’re constantly worried about money. Taking control of your spending and setting a budget is one easy way to overcome the tension you feel toward your finances. However, many people shiver at the idea of setting one because creating a budget often seems overwhelming, and the idea of sacrificing certain everyday pleasures may sound too restrictive. But, what many consumers don’t realize is that this basic money management skill can actually help you feel less constrained in your spending and more in control of where your money goes, allowing you to experience more freedom in your finances and your lifestyle. And, ultimately stress less. Although the actual task of analyzing, tracking, and drawing up a budget can be tedious, there are plenty of tools and apps that can make it easy while keeping you on track. Let’s look at five of the best budgeting apps to help you set and stick to a budget. Budgeting is a no-brainer with this money management tool. After linking all your financial accounts, including your bank, credit cards, retirement savings and more, Mint suggests a budget based on your average spending patterns, allowing you to make adjustments as you go. You’ll stay accountable for each and every dollar you spend by setting alerts for purchases in real time. The app will even notify you if you’re about to go over budget in any one category so you can rein in your spending. Mint also sends you a weekly summary of your spending and saving habits which helps you identify areas that need improvement. Another great feature of the app is its ability to help you manage bills and utilities. Mint alerts you when a bill is due and you can even schedule payments through the app to avoid racking up wasteful late fees. 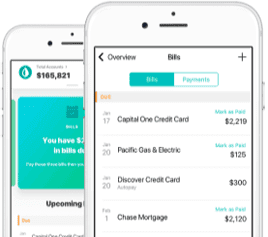 The free Clarity Money app helps you plan your budget, save money, track expenses, check your credit score, and manage your financial accounts. It even helps lower your recurring bills by negotiating charges on your behalf as well as canceling unwanted subscriptions and services. Clarity Money will also take note of your spending and savings habits to offer financial products, such as personal loans or credit cards, that can help you save more. 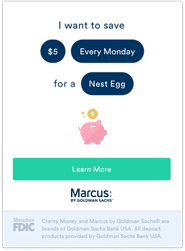 Its recent acquisition by Goldman Sachs means users can also access a high yield savings account from Marcus to get a better return on their savings. The Mvelopes budget is pretty straightforward — you stash away cash into separate envelopes designated for different expenses — such as groceries, gas, clothing, and entertainment— that you aren’t supposed to touch for anything else. Although it’s a pretty basic budgeting system, separating cash every month into envelopes can become a time-consuming task, especially since most people get paid via direct deposit into their bank accounts these days. Luckily, you can adopt this budgeting system more easily by using the Mvelopes app. 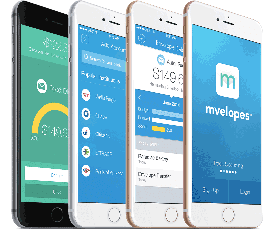 The Mvelopes app allows you to sync your bank, credit cards, and other financial accounts in one place and helps you create a spending plan based on digital envelopes, giving every dollar a purpose so you stop wondering where it all went. Plus, the auto transaction syncing feature ensures you know how much you have available in your accounts before you overspend. The basic plan is likely all you need to organize your finances and costs just $4 per month. For those who need a complete financial overhaul, check out the app’s 10-week budget makeover, offering a financial assessment, personal finance training sessions, biweekly budget reviews, text check-ins and more. YNAB allocates every dollar you earn into a specific fund even after you’ve paid all your bills. This may include categories such as paying off debt or various savings goals such as travel, entertainment or retirement. By assigning a specific task for every dollar you earn, YNAB ensures your money doesn’t disappear on wasteful spending. You’ll get detailed reports so you can analyze your money habits and make adjustments to daily and monthly spending. Plus, you can share expenses with someone else through the app to help you strike financial harmony with your partner. The app will even offer tips on how to improve your spending and get out of debt if it senses you aren’t making improvements. PocketGuard is a basic budgeting app that allocates your expenses into specific “pockets” for easy tracking. The app calculates your bills, income, savings goals, and expenses to show how much you have left each month. 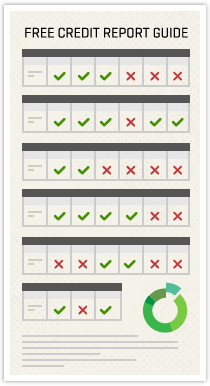 You can take charge of your spending by setting limits for each category. If you overspend in any given pocket, you’ll get a notification so you can identify the issue and learn how to manage your money better moving forward. Although you can’t track cash spending with the free version, you can upgrade to the paid Plus option for the ability to track one-time and recurring cash spending for $3.99 per month. With PocketGuard Plus, you can also track cash you spend and receive, plan for cash bills, like your share of the rent, and add more pockets, among other features. A budget helps you track your money better, ensuring you know where each and every dollar goes so you can pinpoint areas where you’re overspending — perhaps without even realizing it — and make better decisions with how to use those funds. This means you can spend your hard-earned dollars in more meaningful ways, such as on things and experiences you value most. Maybe this means cutting back on dining out expenses so you can save up for that dream vacation. Whatever your passion, you can make it a reality by changing your spending habits. Whether you have debt you want to pay off or savings goals you want to achieve, a budgeting app is a great way to help you visualize your spending, recurring bills, and savings in one place. Most of the budgeting apps featured are free, while others cost no more than a few bucks a month, and are a wise investment in your financial future. Andrea Woroch is a nationally recognized consumer finance expert, writer, and TV personality who is passionate about helping families find simple ways to spend less and save more without making major sacrifices. As a go-to media expert, Andrea has appeared on popular TV shows such as Today Show, Good Morning America, FOX & Friends, Dr. OZ, CNN, and MSNBC. Her practical budgeting and savings advice has helped millions of Americans initiate real financial change so they can stress less and spend more time doing the things they love. Her advice has been featured in The New York Times, USA Today, Forbes, Reader’s Digest, Cosmopolitan, Money, Time, and Woman’s Day, among other outlets. Andrea also hosts a monthly money segment on KTLA Morning News in Los Angeles.